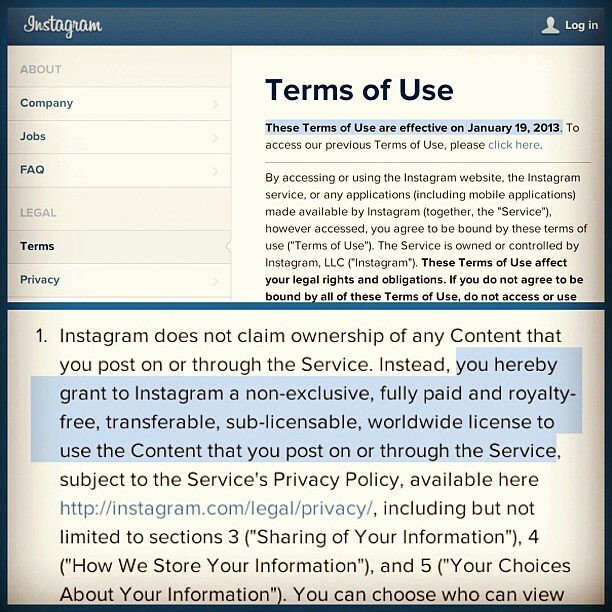 If you thought Instagram’s new terms introduced in December 2012 were awful, their update today is even worse. Gah! I have two days to delete my instagram account before instagram forever owns my 630 photos! Those sound like super mega atomic bomb words. Do you think this type of all-inclusive gobbledegook would really hold up in court? Hmm, I don’t know. I know next-to-nothing about law. But it seems like Instagram (with Facebook lawyers) would be able to get away with it. People accept the terms. Who’s gonna challenge? Whaaaaat?! I think this is a case where the lawyers have gotten in the way of common sense. Yeah, it makes me sad that people continue to use instagram when instagram is so in violation of photo rights. Besides, flickr is by far and away the best photo service. Hey, guess what! Facebook make their terms and conditions worse too! Now they can use any of your images, or status updates in ads. Yuuuuup. Facebook might be next on my chopping block.